Snow fell across southern and central Minnesota throughout the day on Sunday, with totals reported through 6 PM between about 2-6" across most of the Twin Cities. 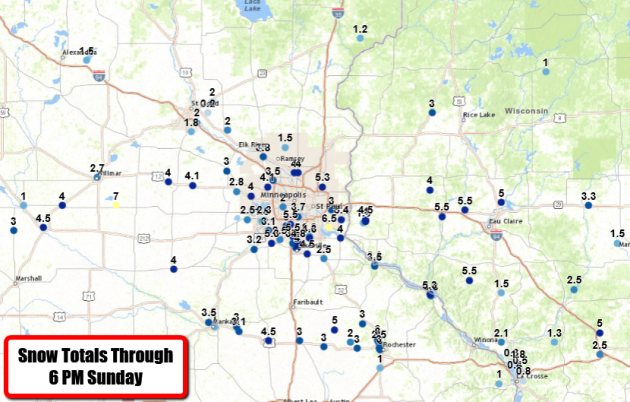 The top two snow totals through 6 PM Sunday had been 7" in Lake Lillian (southeast of Willmar) and 6.5" in Cottage Grove. Places like Bloomington and Burnsville had reported 5.5" of snow. This snow caused numerous incidents on the road throughout the day, including two large pileups - one on I-694 in Shoreview, and another on I-94 near Eau Claire. Okay, who is getting tired of winter... cause I'm sure it's not just me. It's been a wild few weeks across the region between the snow and cold, and winter isn't giving up just yet. Another storm system is set to impact the region late Monday into Tuesday, bringing another round of snow (heavy in spots) along with it. We can see the snow moving into the state late Monday, lasting through Monday Night and into the day Tuesday. The heaviest snow with this system is expected to fall across southern and southeastern Minnesota into western Wisconsin, where snow totals of at least 6" can be expected to begin the week. This is the overall snow totals expected from Sunday to Tuesday - so this includes snow from both systems impacting the region. Three day snow totals could approach and exceed a foot from the Twin Cities into southeastern Minnesota into western Wisconsin. 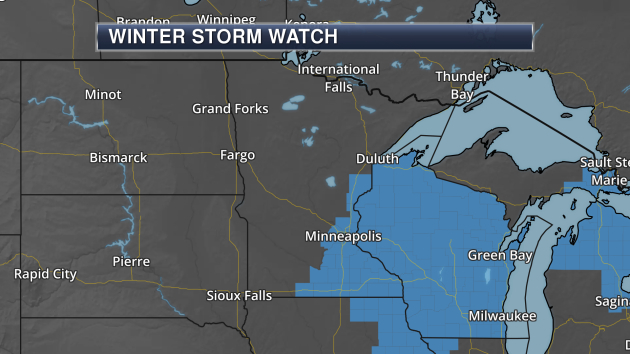 ...HEAVY SNOW POSSIBLE LATE MONDAY AND TUESDAY... .A Winter Storm Watch has been issued for parts of south central and east central Minnesota and west central Wisconsin for late Monday through Tuesday. 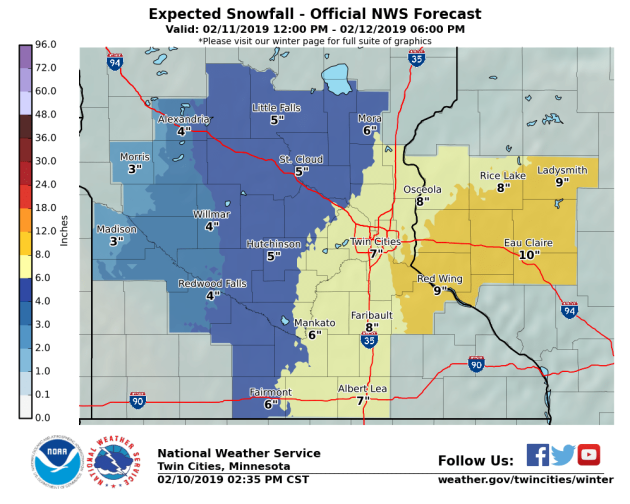 The Watch is in effect for locations generally east and south of a Rush City to Twin Cities to Fairmont line, where snowfall accumulations in excess of 6 inches appear possible. A period of freezing rain or freezing drizzle will also be possible on Monday as the precipitation is beginning. Blowing snow and attendant visibility reductions will also be possible on Tuesday as northwest winds increase. In the meantime, a Winter Weather Advisory remains in effect for areas east of Lakeville to New Richmond until 9 PM. Snow covered roads with slippery conditions will remain possible into tonight. MNZ060>062-068-069-076-077-110700- /O.CAN.KMPX.WW.Y.0012.000000T0000Z-190211T0000Z/ /O.CON.KMPX.WS.A.0004.190212T0000Z-190213T0000Z/ Hennepin-Anoka-Ramsey-Carver-Scott-Le Sueur-Rice- Including the cities of Minneapolis, Blaine, St Paul, Chaska, Shakopee, Le Sueur, and Faribault 448 PM CST Sun Feb 10 2019 ...WINTER STORM WATCH REMAINS IN EFFECT FROM MONDAY EVENING THROUGH TUESDAY AFTERNOON... ...WINTER WEATHER ADVISORY IS CANCELLED... * WHAT...Heavy snow possible. Total snow accumulations of 5 to 8 inches possible. * WHERE...Portions of east central and south central Minnesota. * WHEN...From Monday evening through Tuesday afternoon. * ADDITIONAL DETAILS...Travel could be very difficult. The hazardous conditions could impact the morning or evening commute. With 3.7” reported Sunday at MSP airport in the late afternoon climate report, that brings the February total so far to 10.4” - 8” above average. 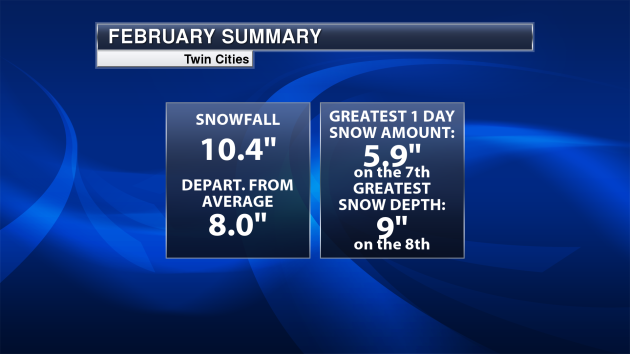 Depending how much snow falls in the Monday/Tuesday snowstorm here in the Twin Cities, we could easily break into the top ten snowiest Februarys on record with over a half a month to go. The snowiest February on record was back in 1962 when 26.5" of snow fell... but we only have to surpass 2011's 16.1" to break into the top ten. I love snow for the same reason I love Christmas. It brings people together while time stands still wrote Rachel Cohn. In a day and age when we disagree about just about everything, at least we agree on the weather. "Cold outside." Yup. "Looks like a slow drive in today." Yup. "At least it's free?" Good point. There is something uniquely democratic about a fresh snowfall. It doesn't matter where you live, what you drive or how much money you made last year. You're going to creep along, just like everybody else. 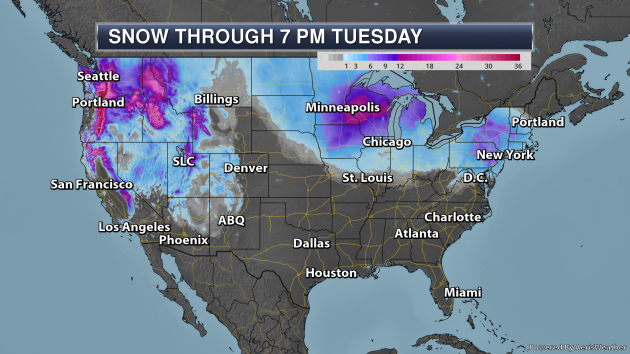 Our snowy groove continues this week as Pacific storms track south of Minnesota. Dry weather persists through the daylight hours today, but another jolt of snow arrives tonight and Tuesday. 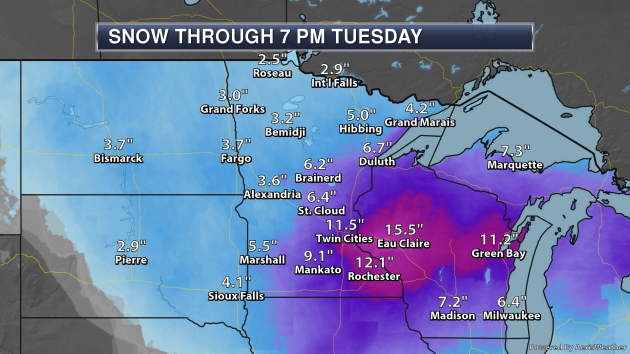 Heaviest amounts will fall south/east of the Twin Cities, where some 8 inch amounts are expected. This should be plowable, somewhere in the 3-7 inch range for much of MSP; less west of the metro area. Enjoy 20s today and Tuesday; highs hold in the teens into much of next week. MONDAY: Dry today, snow tonight. High 27. Low 23. Chance of precipitation 60%. Wind E 10-15 mph. TUESDAY: 3-7 inches snow. Heaviest east side. High 26. Low 4. Chance of precipitation 90%. Wind NW 10-20 mph. WEDNESDAY: Mostly cloudy and colder. High 16. Low 6. Chance of precipitation 10%. Wind NW 8-13 mph. THURSDAY: Light snow or flurries possible. High 20. Low 13. Chance of precipitation 40%. Wind NE 7-12 mph. FRIDAY: Icy start, snow tapers to flurries. High 18. Low 5. Chance of precipitation 70%. Wind NW 10-15 mph. 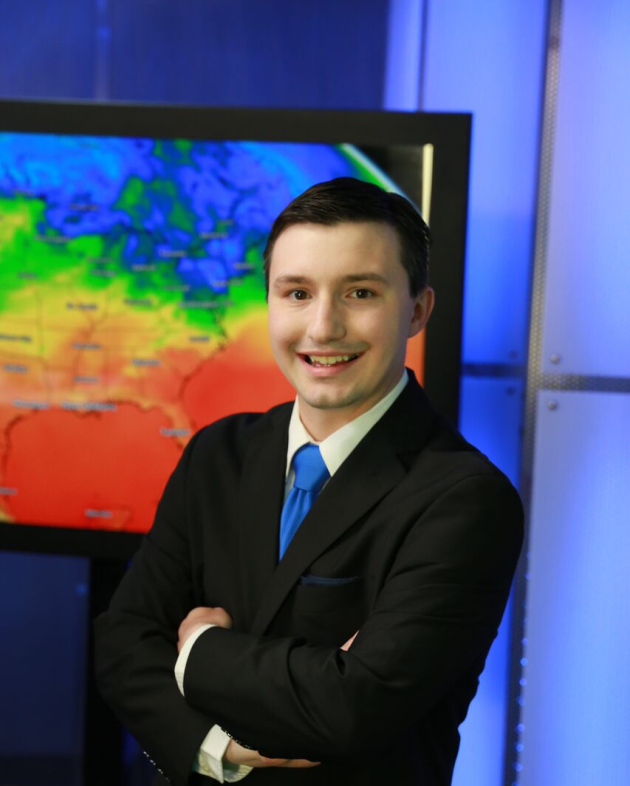 SATURDAY: Mostly cloudy, still brisk. High 16. Low 3. Chance of precipitation 20%. Wind NW 8-13 mph. SUNDAY: More sunshine, fresh air! High 15. Low -3. Chance of precipitation 10%. Wind NW 8-13 mph. 1932: Mizpah picks up 13 inches of snow in a storm. 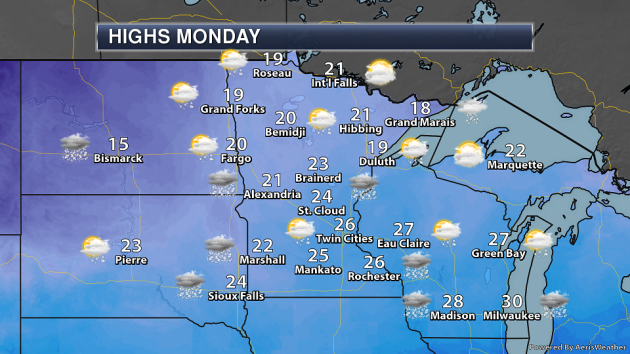 Snow will be moving in across the state late Monday, likely reaching the Twin Cities after the evening commute. Mainly cloudy skies are otherwise expected. 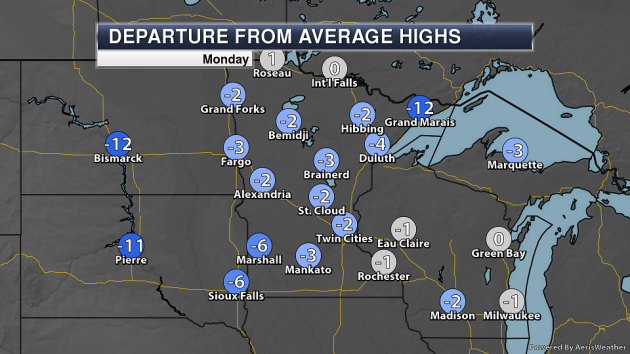 Highs will climb into the 20s in most parts of the state - the expections being parts of northern Minnesota where they will only be in the teens. Heavier snow will be likely across southern Minnesota as we head into Monday Night. 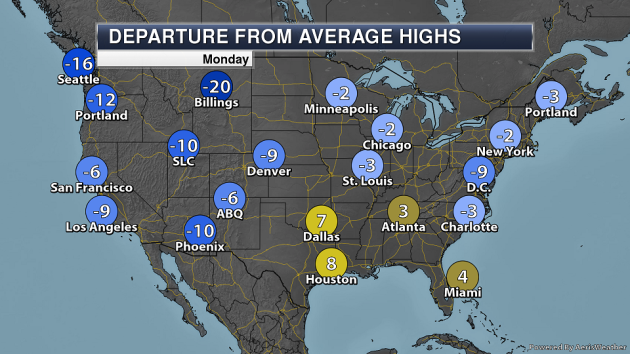 Highs will actually be just a few degrees shy of average across most of the state. Temperatures will stay somewhat steady through much of the week, with highs in the teens and 20s. The coolest days right now are expected to be Wednesday, Friday, and Saturday. After our snow on Sunday, then again Monday and Tuesday, things calm down for a day. More snow chances roll in Thursday into Friday, but that system only looks to bring a few inches of snow along with it at the moment. 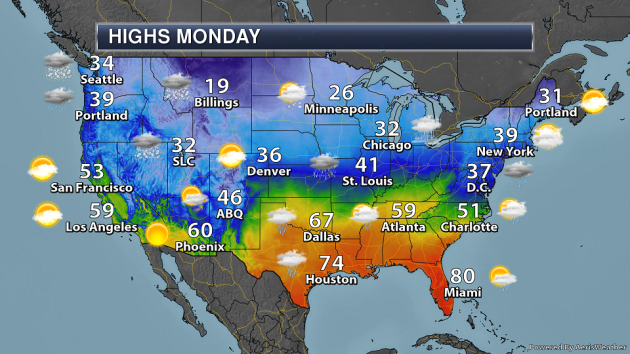 Monday will feature a messy weather set-up across a good portion of the nation. A low pressure area moving through the central part of the nation will bring snow, heavy at times, across the Northern Plains into the upper Midwest and Great Lakes. An area of mixed precipitation or ice will be possible from Nebraska to the Washington D.C. area. In the warm sector of the system, across parts of the central and southern Plains into the Ohio Valley and Southeast, showers and storm will be possible. Meanwhile another storm in the Pacific Northwest will bring rain and snow with it, with another round of snow for Seattle. Two areas of heavy precipitation is expected through the beginning of the week. 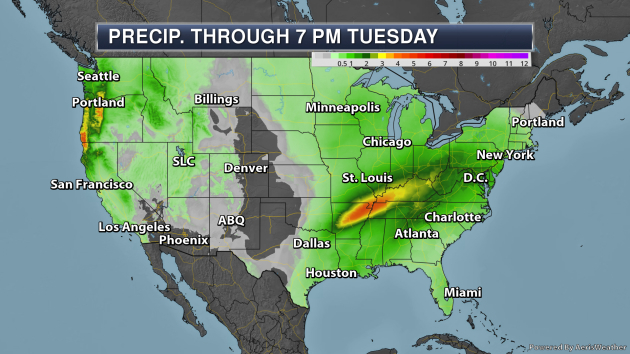 The first is from Arkansas into parts of the Ohio Valley, were at least 3-4" of rain is possible, with some of the heaviest rain expected Monday. In the west, heavy rain of at least 3" is likely along the Oregon and northern California coasts. A few areas of heavy snow are likely through the first part of the week. One will be in the upper Midwest, where a winter storm could produce at least 6" of snow Monday into Tuesday. In the Northeast, some areas could see over 6" of snow. And heavy snow will continue out west, including in Seattle where 6-10" of snow will be possible through Tuesday. More snow is on the way for Seattle through the beginning of the week, on top of the 10.6" of snow that has already fallen this month in Seattle. Already Seattle is sitting at their fifth snowiest February on record across their entire record, and the second snowiest since records started in 1945 at Sea-Tac. The first system to impact the region will be later today into tonight, with Winter Weather Advisories in place for Seattle due to the potential of 2-4” of snow. The second – and heavier – system will move in Monday lasting into Tuesday. That system will bring the potential of an additional 5-10” of snow to Seattle. Winter Storm Watches have been issued for this time period. We’re also tracking the potential of a winter storm across parts of the upper Midwest Monday into Tuesday. This system will bring the potential of at least 6” of snow to parts of northern Iowa, southern Minnesota, and northern and central Wisconsin, and looks to impact the Tuesday morning commute in the Twin Cities. Another Couple Blasts Of Snow For Seattle. The snow hits will keep coming through at least the beginning of the week for Seattle. Two different systems will impact the region, the first of which reaches the Pacific Northwest later today lasting through the overnight hours tonight. That'll bring the potential of about 2-4" of snow. Due to that, Winter Weather Advisories are in place, including in Seattle where it is in place from 4 PM this afternoon to 4 AM Monday. While there looks to be a brief break in the systems, the second storm already starts to arrive during the morning hours Monday across the region, lasting into Tuesday. That system will bring the potential of 5-10" of snow to Seattle with the heaviest accumulation expected Monday afternoon and night before some freezing rain, rain, or sleet has the potential to mix in. Due to this second, heavier system, Winter Storm Watches have been issued including Seattle from Monday morning into Tuesday afternoon. Seattle Snow Potential Through Tuesday. When you combine both systems on the way for Seattle, the metro will see the potential of an additional 6-10” of snow through Tuesday. Once again, the heaviest snow will be with the second system, especially Monday and Monday Night. I would expect rough to near impossible travel conditions with this wintry weather through the first couple days of the work week. Potential Upper Midwest Snowstorm Monday Into Tuesday. As we head toward Monday and Tuesday across the upper Midwest, we will be watching the potential for a heavy snowfall with areas where snow of at least 6" will be possible. This area of heaviest snow has trended a little east since yesterday, situated from northern Iowa through southeastern Minnesota into northern Wisconsin, but there is still some uncertainty in this forecast. While Winter Storm Watches have yet to be issued, it would be likely they will be issued later today for this system across the region. More from Yale Environmental 360: "The Hohokam were an ancient people who lived in the arid Southwest, their empire now mostly buried beneath the sprawl of some 4.5 million people who inhabit modern-day Phoenix, Arizona and its suburbs. Hohokam civilization was characterized by farm fields irrigated by the Salt and Gila rivers with a sophisticated system of carefully calibrated canals, the only prehistoric culture in North America with so advanced a farming system. Then in 1276, tree ring data shows, a withering drought descended on the Southwest, lasting more than two decades. It is believed to be a primary cause of the collapse of Hohokam society. The people who had mastered farming dispersed across the landscape. " More from WBUR: "Almost 2 billion people depend on water from the Himalayan mountains. By 2100, though, at least one-third of the region's glaciers — which supply freshwater to China, India and Pakistan — will be gone, according to a new report. “Between a quarter and a third of the human population on this planet depend on the water resources from the mountains in this region,” says Laurie Vasily, head of knowledge management and communications at the International Centre for Integrated Mountain Development. "So it's a critically important resource of course for the region, but a global resource also.”"
More from The Guardian: "The people of Townsville know about heavy rain, but this was new. Over the past fortnight, the northern Queensland city’s 180,000 residents have been hit by a monsoon strengthened by a low-pressure front that dragged moist air south from the equator to Australia’s top end. It dumped an unprecedented 1.4 metres of rain in less than two weeks – roughly double what falls on London in a year. The ensuing chaos has wrecked homes and caused hundreds of millions of dollars of damage to property. Two men have drowned and videos posted to social media have shown crocodiles climbing trees and taking to elevated highways in search of shelter."